The Cinque Terre villages are closed to car traffic, except for the residents. The available parking spaces are very limited and are often at the entrance of the villages. To park in the Cinque Terre costs around 15 Euro per day, free parking is only available outside the villages. The color of the lines on the parking space indicates the type of parking: white is for free parking, blue is for paid parking. 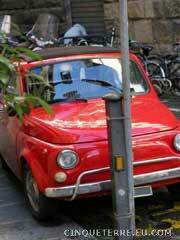 When you park be sure that you do not park in areas reserved for residents (parcheggio residenti). The parking fines in Italy are expensive, about 38€. Fines will be collected abroad. It can be easier to find a parking spot in the nearby small town of Levanto where there are two big parking lots: one near the railway station and the other near the sea.